In our Kita lives a dwarf. 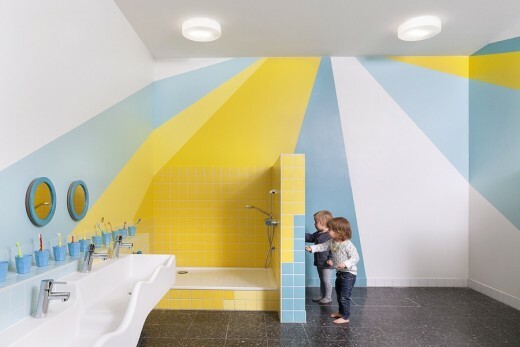 Since April 2014, 30 children, ages 1-6 years, play, run around, explore, and cuddle in the 180 square meters large Kita Zauberzwerge (nursery“Magic Dwarves”), which is located in Berlin Steglitz. 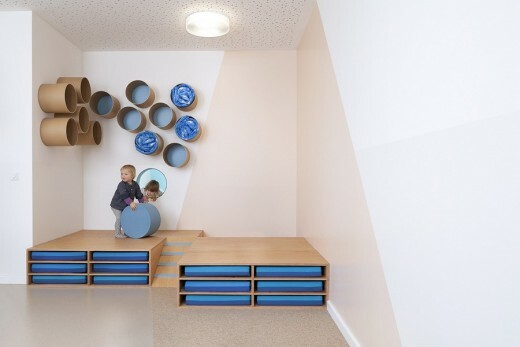 In only eight months of planning and construction, a former industrial unit was transformed into three brightly hued rooms accommodating age-appropriate common areas, a game hall, bathroom, cloakroom and small kitchen. The design idea is a walk-through rainbow that reveals itself inside this newly transformed former business unit. 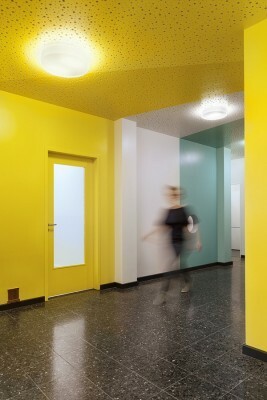 The colored stripes that embellish the walls and ceiling lighten up the hallway, creating a world of its own which emits a brighter and friendlier atmosphere then the former dimly lit unit. The colored stripes extend themselves until they reach the large spacious windows of the furnished group rooms and bathroom. 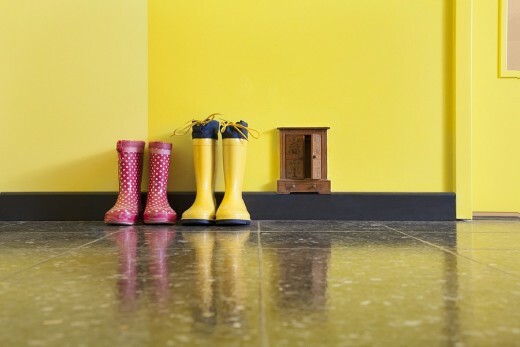 Regardless of their material, the walls and tiles are in yellow and turquoise tones. 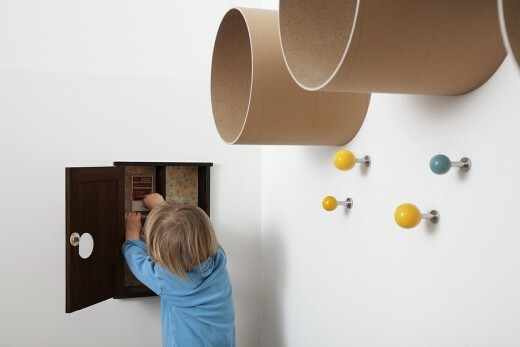 The childs urge to play and explore is encouraged with circular openings between the walls of the space. 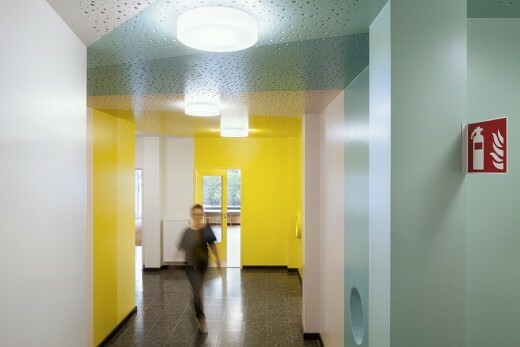 When left open, these small circular holes provide interesting passages and viewpoints into the group rooms and game hall but also can be closed if necessary. The Kita Zauberzwerge is furnished with Baukind multifunctional tables and block stools. 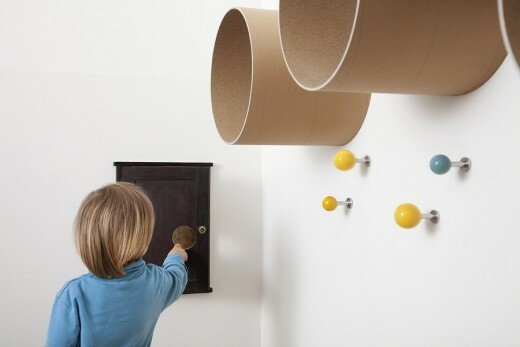 The Baukind tube shelves hang on the walls of the 1-3 year age group dressing room and common area. The extra deep wooden window sills are designed to function as a radiator cover, shelf, seat and bench. 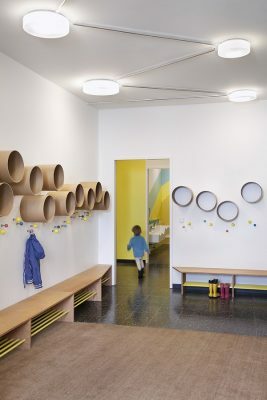 In the corners of the room, the older kids can transform the space into a snuggle area or invent new hiding spots by stacking large building blocks. The materials used are made of soft foam or carpet which are ideal for resting areas. This nursery is not only inhabited by 30 children, but also by a magic dwarf. All around the nursery, the children encounter indications of the existence of this magic dwarf: His home is a small wooden box found hidden within the cloak room, built into the wall of the hallway is his little armoire found at the height of the base board. In the bathroom his mirror hangs at mini dwarf height. The magic dwarf itself is unfortunately rarely seen. Anyone can contact this invisible roommate by dropping off a letter at his home mailbox. Using this mailbox, the Magic dwarf becomes a little helper advising the child in various situations of their daily lives. 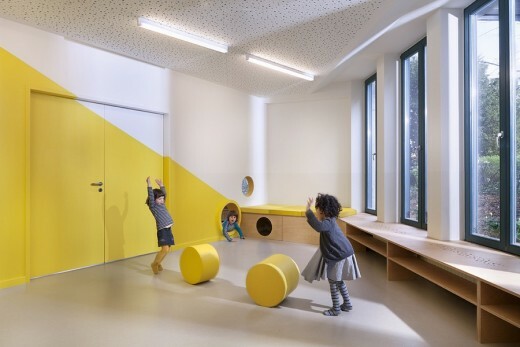 For the Kita Zauberzwerge, Baukind was commissioned for all planning services, ranging from the design to purchasing furnishings as well as the construction management. In addition Baukind once again arranged a financial provider in applying for funding and was also in charge of coordinating all agencies involved in this project.